Banned Books week is a time to celebrate the Freedom to Read that we express in our school community and library. Books are challenged for a variety of reasons, often within different school districts in the U.S. and Canada. Patrons, parents, or school administration may challenge a book and attempt to pull it off the shelves of the library or from the curriculum of the school, often because they want to protect the students, or prevent other patrons from reading. Each day during this week, we will feature a title from each of our three divisions to learn more about the challenges in other schools, districts, and with other readers to highlight the challenge stories that readers across the globe face. The AAS Library believes in the freedom to read, and the access to information for our all of our patrons. 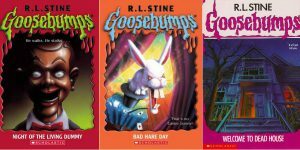 Most teachers and parents will recognize the Goosebumps Series, small spooky stories written by R.L. Stine. This series is in the top 100 most banned books of the decade, along with several of his other titles for older readers. These books have haunted young readers since 1992, with titles like Night of the Living Dummy, A Night in Terror Tower, and Bad Hare Day. Some people say that “the books are too scary for kids,” “there are disturbing scenes, violence, and dialogue,” and “children will be unable to handle the frightening content.” While the series seems almost out of date in the year 2017, the “too scary” challenge is quite common. “Unsuited for Age Group” is a common challenge placed against books. Adults often underestimate children and what they can manage, as well as their ability to choose what they consider too scary. Should books be pulled from the shelves because of the reactions of some of the readers? See another perspective here about R.L. Stine and his works. Religion is a contentious issue in the world of literature, with many of the challenges against certain books led by religious organizations. 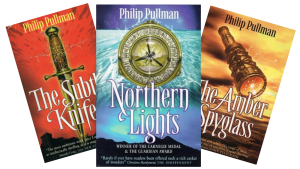 The His Dark Materials series by Philip Pullman has been challenged, restricted, and banned because of the book’s critique against organized religion. His book is no exception in the world of fantasy. The Harry Potter series is among the most challenged of all time, because of its “encouragement” of witchcraft and wizardry. However, with Dark Materials, the series is considered “anti-religious” and “anti-Christian,” especially with interview notes from the author confirming that he is an atheist. One school even put a note on the inside cover of the books telling readers that the church in the story is not reflective of the real Roman Catholic Church. While these challenges have fallen from this title because of its age and popularity, there still are other titles that critique and threaten organized religions beyond Christianity. Should books be pulled from the shelves because they offer a view that might be offensive? See the top 10 lists here. 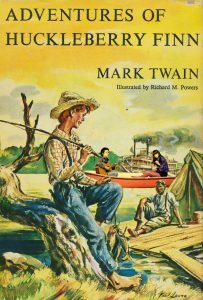 The Adventures of Huckleberry Finn has been challenged time and again since its release in 1884. Schools have put it on required reading lists and then removed it from those lists, primarily because of racial slurs. The book has been challenged as racist, oppressive, insensitive, and degrading. Some schools have retained this title, both on the shelves and in the curriculum, while others have changed their curricula to put the novel in context. Still other schools required teachers to attend seminars on how to deal with race in the classroom before they taught the book. There is debate about whether or not the book contributes to a racist environment, or if the historical context is worth more than the language that it is written with. Other more current books that tackle racial themes have been released and found glowing receptions from readers, but this book stays on reading lists throughout the US. Should books like these, with their historical use of language, be used in school curricula as classes? Should the context of the racial history be found in a different way, through modern texts? See a quick summary of Huck Finn here. This entry was posted in Events, Uncategorized and tagged banned books by Kelsey Hedrick. Bookmark the permalink.